The Warren Buffetts Next Door profiles previously unknown investors, with legendary performance records, who are proving every day that you don’t need to work for a hedge fund or have an Ivy League diploma to consistently beat the best performing Wall Street professionals. These amazing individuals come from all walks of life, from a globe drifting college dropout and a retired disc jockey to a computer room geek and a truck driver. Their methods vary from technical trading and global macro-economic analysis to deep value investing. The glue that holds them together is their passion for investing and their ability to efficiently harness the Internet for critical investment ideas, research, and trading skills. Contains case studies that will explain to you how these great individual investors find and profit from stocks and options. In an era when the best professional advice has cracked many investor nest eggs and Madoff-style frauds have shattered investor trusts, the self-empowered investors found in The Warren Buffetts Next Door offer an inspiring and educational tale. 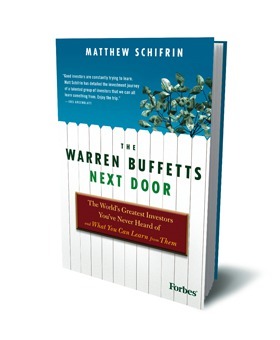 This entry was posted in Books and tagged matthew schifirin, warren buffett. Bookmark the permalink.